The wonderful wedding we had last weekend was three years in the making but well worth the wait! Every last detail had been thought through and it was a amazing celebration. The marquee arrived one day earlier than usual and was organised by the bride's uncle who has a marquee firm in Cornwall. They lined the tent with swags of cream silk and hung a sea of cream paper lanterns from the ceiling. A very smart rustic bar was erected at one end and this was run by the same firm. They also provided the tables and chairs etc. Friday brought a team of family and friends to complete the decorations. Bunting was hung round the sides of the marquee - lent by Shillingstone House - and the tables were laid. Hessian runners crossed each one, with a slice of wood in the centre. Onto this went jars of flowers, provided by "Just Add Flowers" - https://www.justaddflowers.co.uk - and arranged by the family. Miniature jars of chilli jam and onion marmalade awaited the adults and pots of pencils and packs of bubbles were waiting for the children. 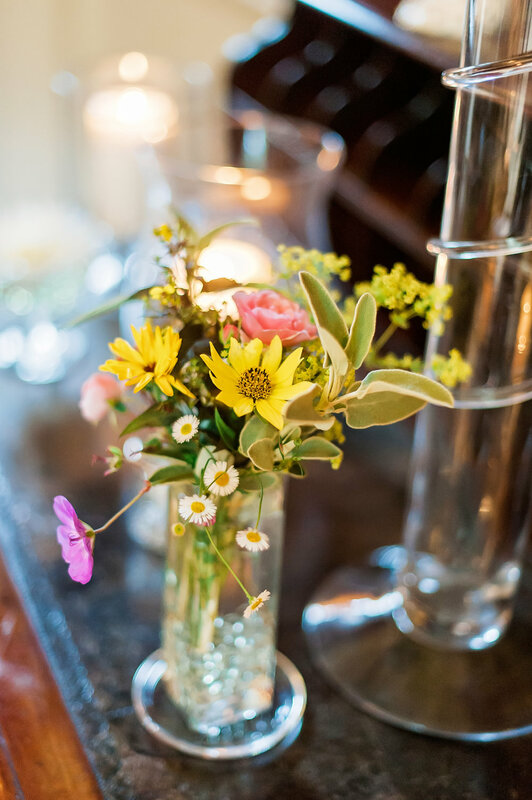 Table placements were displayed in a collection of old frames, sweets in huge jars with striped bags to take them away in and glass jars with large straws were laid in rows ready for Pimms the next day. Memories were asked for in a very novel way with guests being asked to write on pieces of Jenga which the couple could play with later. A beautiful wooden guest book was ready for other comments. Outside the attention to detail and the sense of fun continued. 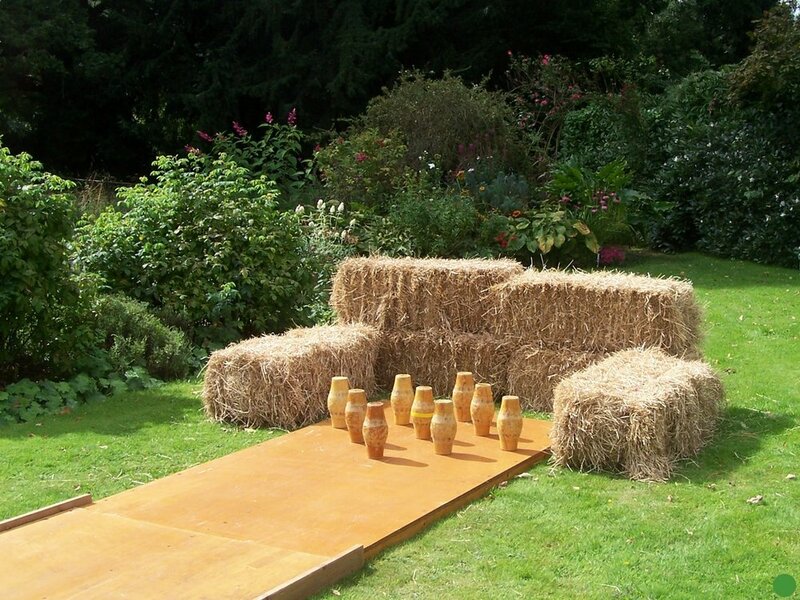 A Skittle Alley was laid out on the lawn and a score card with two blow up pigs, waiting to be thrown as far as possible, was put in position by the summer house. Lights we hung in the trees and lanterns put in the border and by the benches in front of the house. 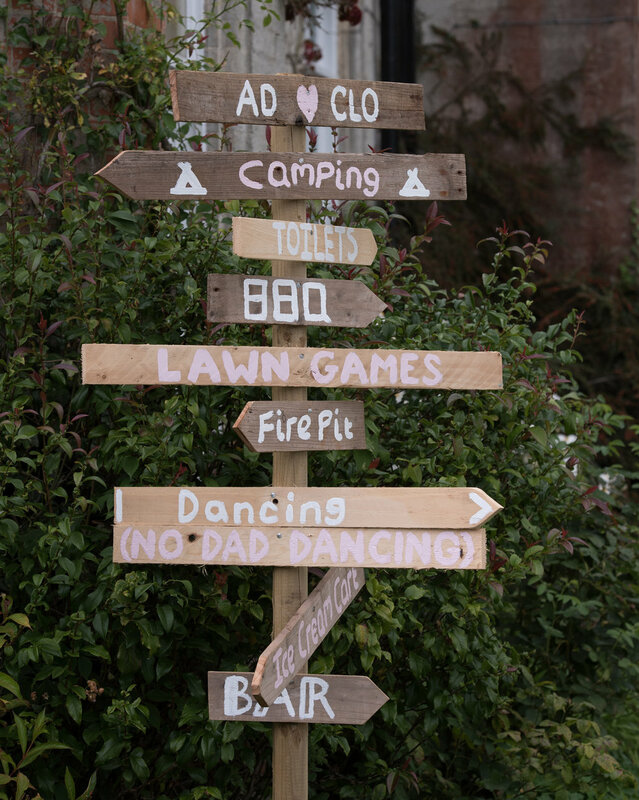 A signpost showed guests where to find everything from camping to the photo-booth which wa arranged in the gazebo. Most of the tents were put up by guests on the Friday but not used until Saturday night. The bride's step father brought in a huge fire-pit for the field and another for cooking breakfast on Sunday which was put in the camping field. Saturday brought the bridegroom and friends to set out chairs before leaving for the church service. The Bride and Groom arrived from the Church a beautiful vintage Karmann-Ghiawhich. I wish I could have taken some pictures of the children playing skittles - they very much had their own rules! Croquet and Giant Jenga was lent by the Ice-cream man to add to the fun. One tiny child managed to manoeuvre his ball with a full size mallett by picking up the ball, placing it in front of the hoop and pushing it through! Evening guests arrived and set up their tents as well. The evening meal took the form of a Cheese Wedding Cake put together by both mothers. This had very little left in the morning! Midnight brought the end of the band and the disco but nothing daunted the party continued round the fire pit in the field. Enthusiastic singing of "Ye Canny Shove Yer Granny off a bus" by one Scottish guest echoed out over the valley! 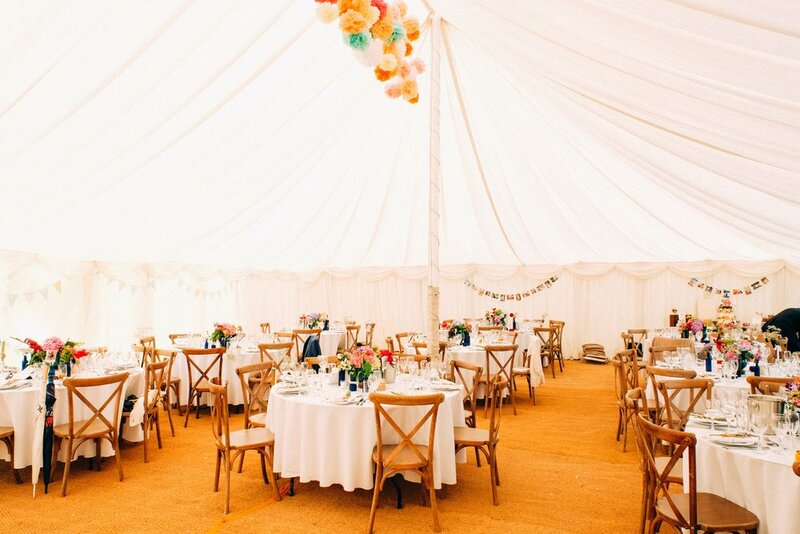 At about 2.30am the campers made their way to their tents with the bride and groom spending the night in the walled garden in our bell tent, choosing the blue interior this time. Breakfast was amazing with the Bride's stepfather cooking bacon, eggs and sausages on a trivet over a fire pit. Guests stayed afterwards to help clear up - the end of a perfectly organised, weekend which had been the greatest fun from the start. The family gathered on Thursday to start decorating as soon as Collins from Wimborne has finished erecting the Marquee. With ultra-cool the bride did not arrive, apart from a quick visit on Thursday evening, until Friday lunch time as she was teaching. Her pupils sent her off in a tiara and sash and driving a car filled with pink balloons and decorated with foil! On Friday, the forecast was dreadful but the family were really laid back about it. An extra small tent was put up close to the gazebo just in case of bad weather. Beautifully decorated baskets of flowers, planted by a family friend, arrived and sheltered here until the wedding morning. Large numbers of family and friends descended to decorate on the Friday. 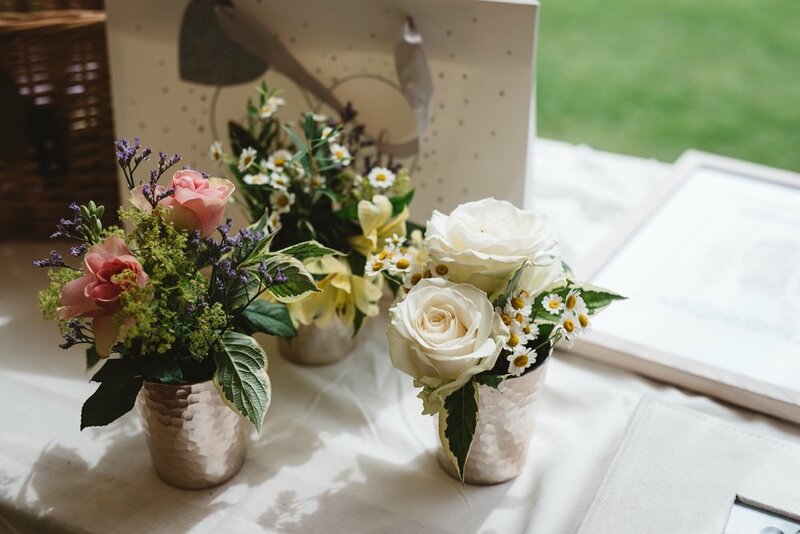 Flowers, provided by the family, were arranged in vintage looking milk churns on the tables, These had hessian bands bordered with lace laid across them and matched the napkin rings. 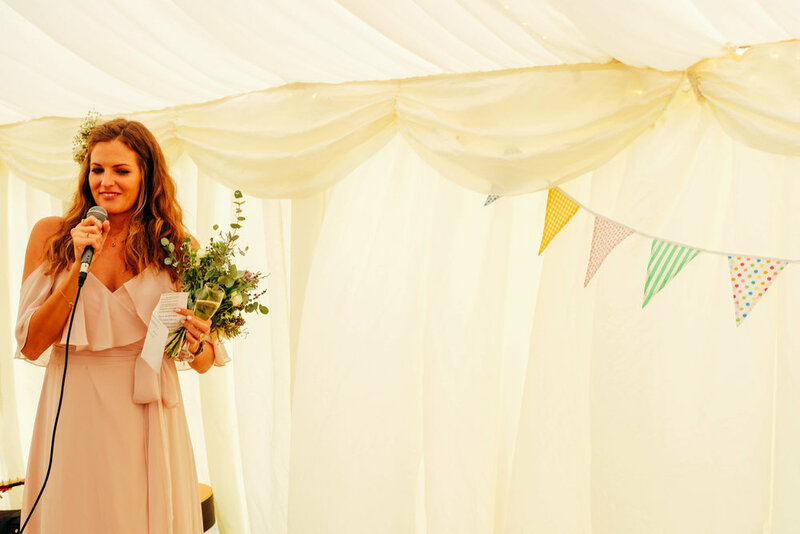 Bunting was strung round the sides of the marquee, a sweet table was put together, complete with brown paper bags with the couple's name on them and a easel with the seating plan, cards pegged onto little washing lines, was placed by the entrance. Outside a wonderful vintage bicycle was parked by the top of the steps with a "welcome" sign fixed to it. Later the basket was filled with flowers. The wedding cake had been copied from a photograph of the Bride's grandmother's cake. Pale pink with very fine white patterns etched on it. 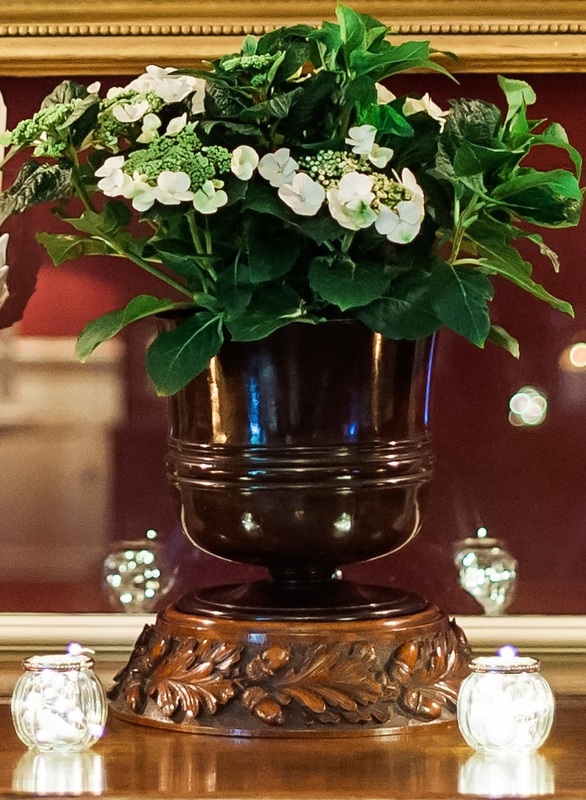 On top was the same vase that her grandmother had used which was filled with flowers. It was really beautiful. The Bride arrived with her bridesmaids, who went with her into the house to see the registrar, before accompanying her and her father across the lawns to the gazebo. 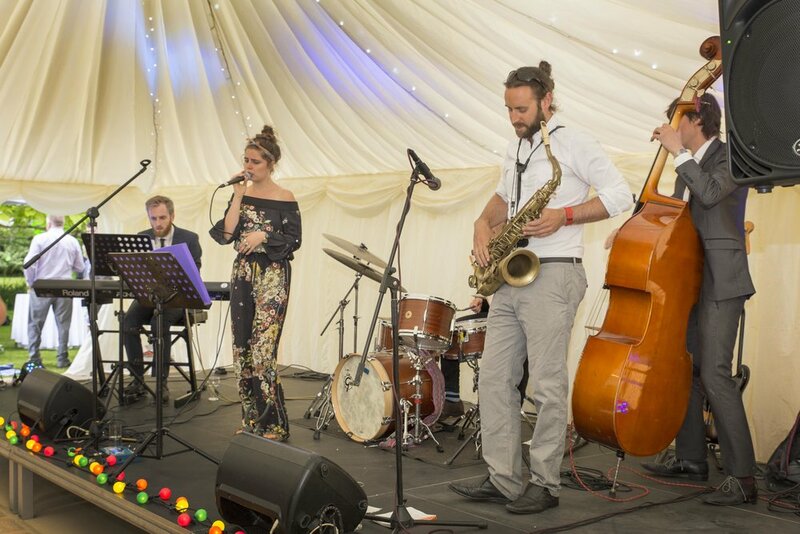 A string quartet played during the ceremony and continued afterwards in the marquee as guests chatted before the wedding breakfast. 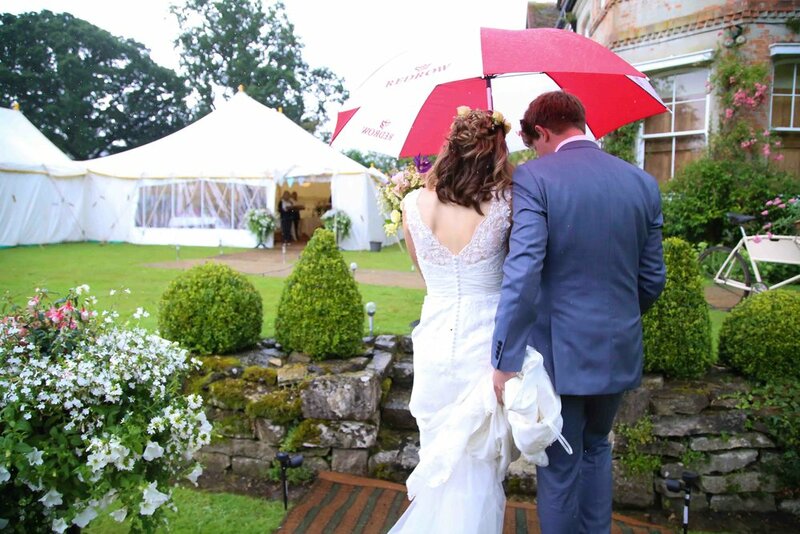 The Rain held off until the Bride and Groom made their way back to the marquee. Later when the rain had stopped they had photographs taken in the grounds by annaluciaphotography.co.uk who took all those not marked with a dot which are in house. While the wedding party celebrated inside a beautiful rainbow appeared over the top of the marquee. The band - Groove on Up - came from London and they kept everyone dancing until the Midnight curfew. ( www.grooveonup.co.uk/) Guests wended their way to the campsite where the party continued round the fire-pit until the early hours. 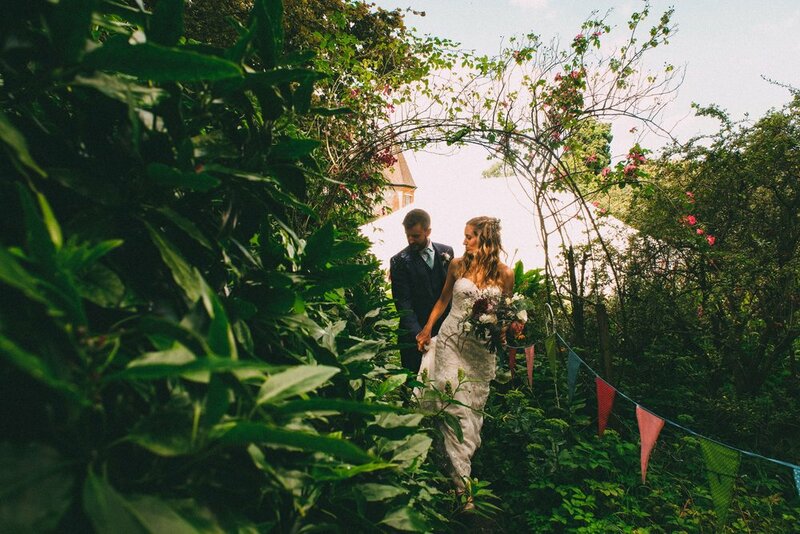 The bride and groom spent the night in the walled garden in our "Indian" themed bell tent. The next morning our wonderful village garage shop was raided for Costa Coffee, sausages, buns and bacon for a barbeque breakfast to wake everyone up enough for the great tidy up. Another wonderful wedding came sadly to an end. By the day before it looked as if the ceremony, that was supposed to be held outside on the lawn by the gazebo, was going to have to move inside to the dining room. Luckily this was a small, ceremony only, wedding so numbers were not an issue. With rain pouring down on the Saturday, we speedily moved and polished furniture, made the dining room table smaller and filled the dining room with flowers and plants, in time for the groom and his brother to come and organise chairs etc. for the ceremony at 4.30. Drinks were set out in the hall, ready for the guests after the ceremony and candles lit in the dining room ready for the bride and guests to arrive. The ceremony took place in front of the open French Windows of the dining room. The rain may have poured down outside but fresh air poured in, making the ceremony as near to outside as possible. After the ceremony, drinks were served and guests braved the weather to have their photographs taken with the bride and groom on the lawn. The bride and groom then went off into the gardens to have their photographs taken - boots and umbrellas were the order of the day! Nothing dampened their smiles. Photographs taken, the bridal party departed for their wedding breakfast - the end of a fantastic if eventful day. 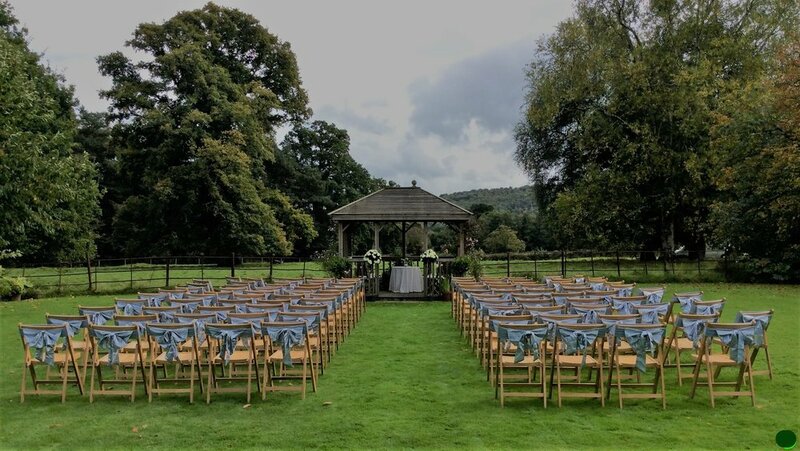 Hayley's mother kindly wrote to say a big "Thank You" and said "You made the venue look wonderful, and turned what could have been a disastrous day (dreadful weather!) into an amazing event" which made all the rushing about well worth it! 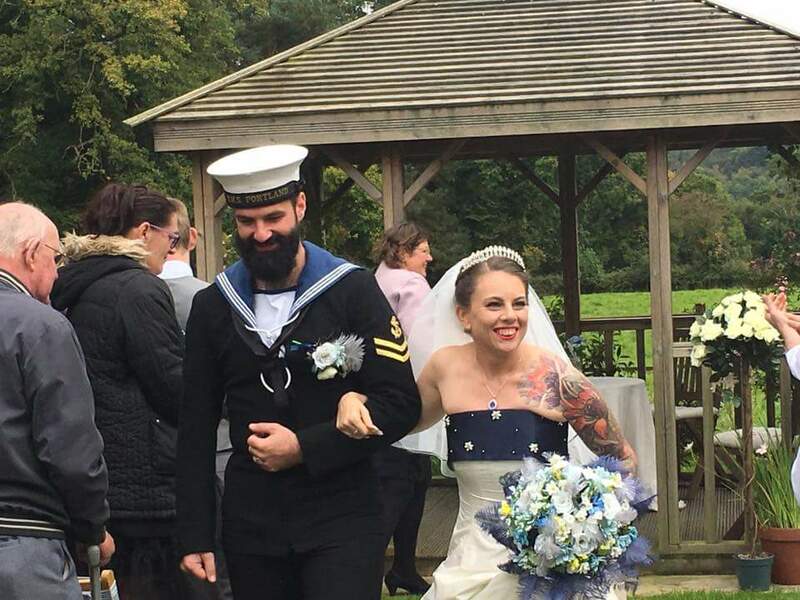 Once again, I was checking the BBC Weather site hourly as rain and thunderstorms threatened the day but the bride and groom were determined to get married outside and they did. Dodging the downpours made for a fabulous, highly organised but totally relaxed wedding weekend. 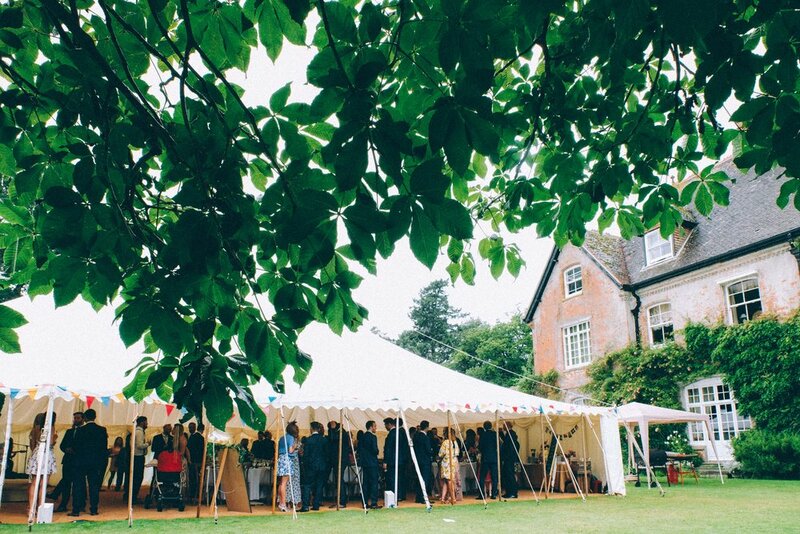 Large numbers of friends and relations descended on Shillingstone House on Friday, each with their allotted task, and bunting was strung round the walls of the marquee and tables were laid. Little personal touches - packets of hankies, confetti, and piles of blankets – were all around. “Jonboy’s” bar (shown above), decorated with fairy lights and more flowers, was assembled in one corner and a wonderful selection of sweets opposite. The couple had printed sheets for the guests giving details of the ceremony and timings for the party afterwards. On the back was a beautiful watercolour of Shillingstone House done by the bride - another wonderful keepsake for us. 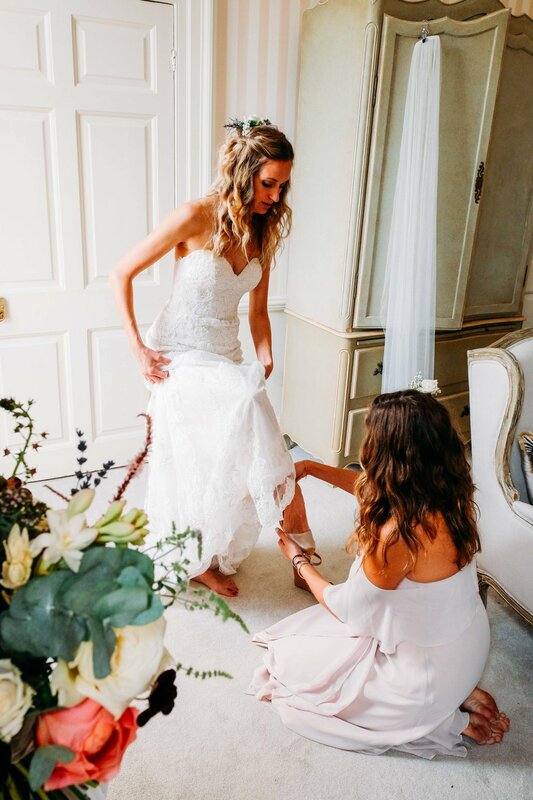 Before leaving for pre-wedding dinners, the family practiced for the following day with the bride given her clipboard to represent her bouquet. 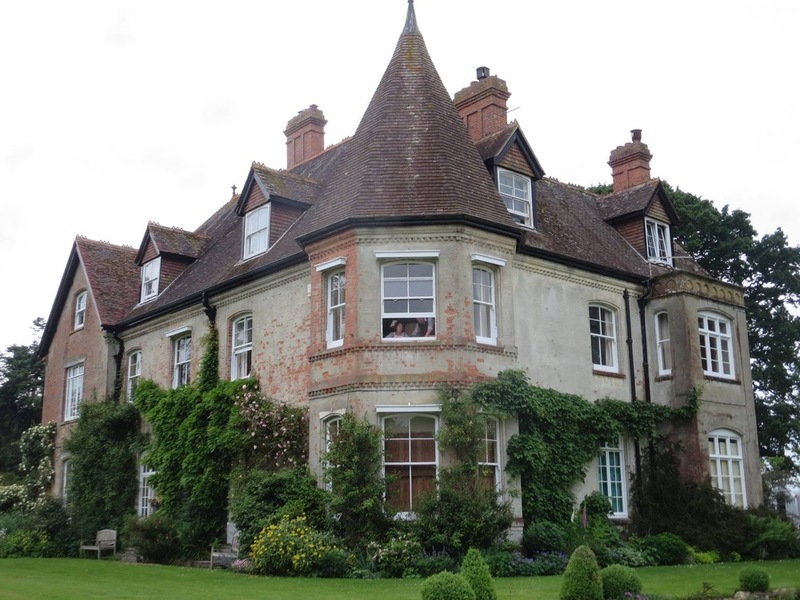 The family stayed in an Hotel in Cranborne the night before and dressed there the following day. Saturday saw the arrival of the cake, an amazing creation of lemon drizzle and vanilla sponge and covered with real flowers, made by a family friend. The groomsmen arrived to set out the chairs. The weather forecast was fine for the morning. No sooner were they in place and they had left to change than the heavens opened. In and out went the cushions! On their return, the groomsmen mopped the chairs and got them ready for the final time. 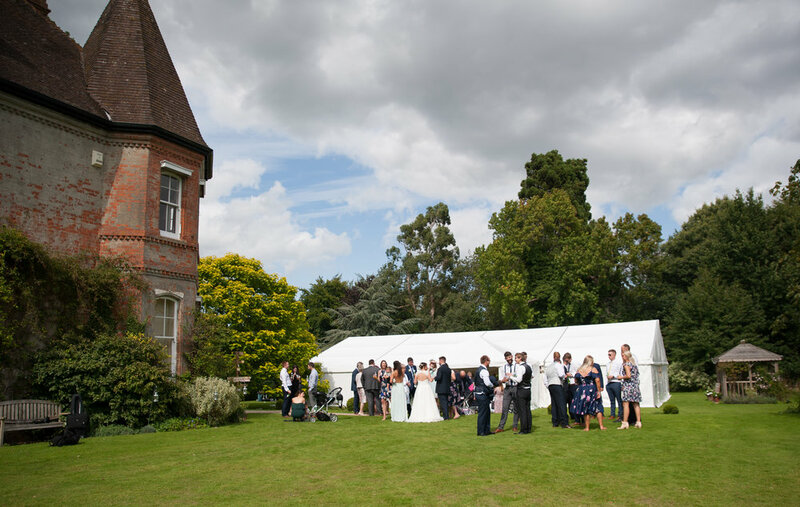 Guests assembled on the lawn for drinks and canapés while the bride and groom had their photographs taken by Claudia Vye who has been several times to Shillingstone and takes brilliant photographs - Claudia took all the photographs NOT marked with a spot which are in house ones. Pudding took the form of wedding cake and an “Orio Cheesecake” made by the bride’s mother. People the next day were asking for the recipe of the latter as it was so good. The band arrived from London ( https://www.alreadylegends.com ) Amongst their repertoire they played some wonderful 60’s music so we were happy inside! The dance floor filled and the party continued to midnight. During their break at 9.30, The Tickled Pig served a huge dish of seafood paella which looked incredible. The staff were here way past midnight clearing up – they had done an amazing job as they had manned the bar as well as serving the food. At midnight, the music might have stopped but the party hadn’t, as the campers moved to the field and settled round a blazing fire in the firepit where they sang until about 1.30 before retiring to the bell tents put up once again by New Forest Bell Tents. The bride had a bridal tent provided by them and her parents slept in ours with the Indian hangings. (www.newforestbelltents.co.uk ). Sunday, sleepy campers were revived by Canadian pancakes cooked by the bride’s mother which were hugely welcome and utterly delicious – filled with blueberries and covered with maple syrup. The end to an amazing weekend – many happy tears were spilt before they all left. Once again I was checking the BBC Weather site hourly as rain and thunderstorms threatened the day but the bride and groom were determined to get married outside and they did. 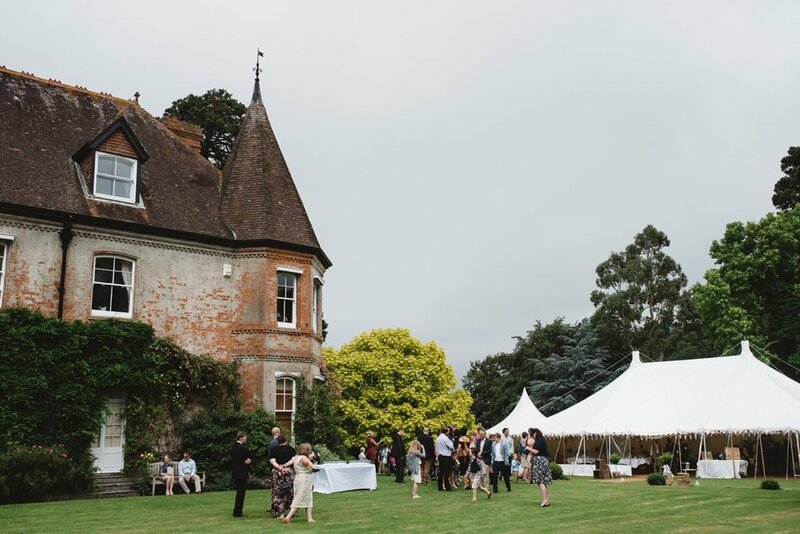 The marquee was set up on Thursday on the main lawn by DP Marquees, a magnificent traditional shape with one wall of windows. The bride had the family sitting in the sunshine making pompoms to decorate the ceiling and these were strung in place by DP. “Jonboy’s” bar, decorated with fairy lights and more flowers, was assembled in one corner and a wonderful selection of sweets on one side. Before leaving for family dinners, they practised for the following day. Pudding took the form of wedding cake and an “Orio Cheesecake” made by the bride’s mother. People the next day were asking for the recipe of the latter it was so good. During their break at 9.30, The Tickled Pig served a huge dish of seafood paella which looked incredible. 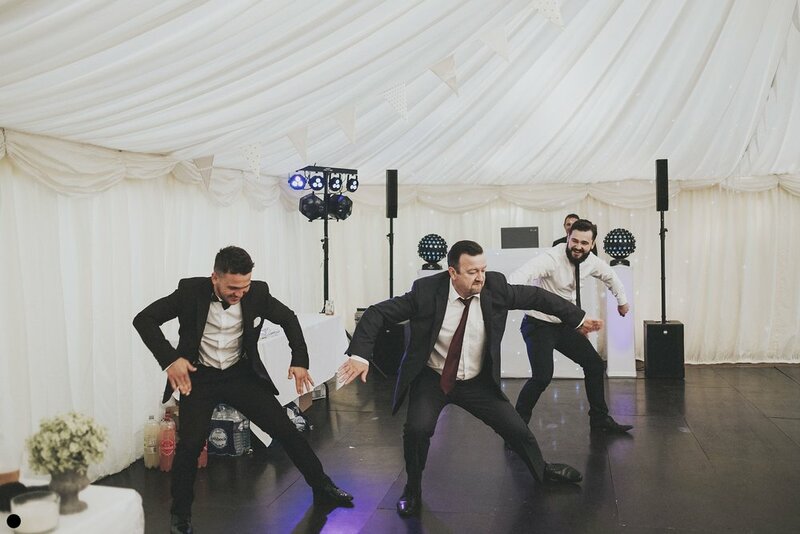 The staff were here way past midnight clearing up – masterminded by Claire, they had done an amazing job as they had manned the bar as well as serving the food. At midnight, the music might have stopped but the party hadn’t, as the campers moved to the field and settled round a blazing fire in the firepit where they sang until about 1.30 before retiring to the bell tents put up once again by New Forrest Bell Tents. The bride had a bridal tent provided by them and her parents slept in ours with the Indian hangings. (www.newforestbelltents.co.uk ). Sunday, sleepy campers were revived by American pancakes cooked by the bride’s parents which were hugely welcome – filled with blueberries and covered with maple syrup. The end to an amazing weekend – many happy tears before they all left. Amazing attention to detail really paid off on the day! 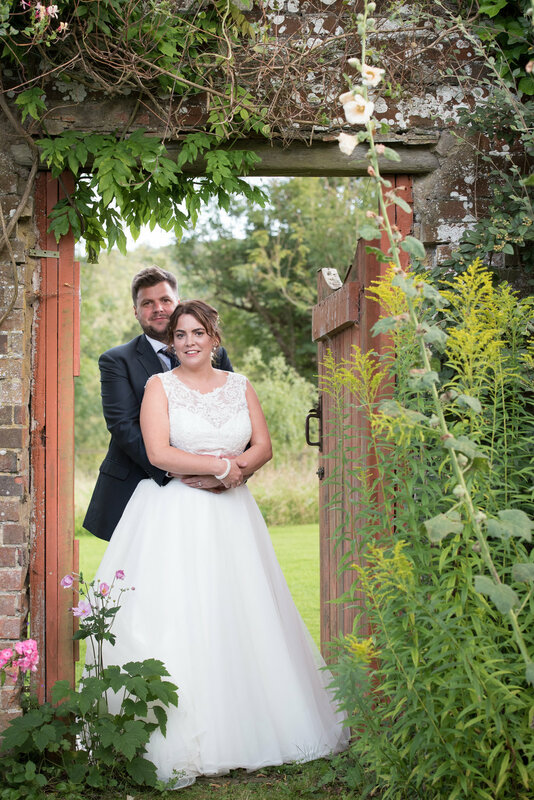 The bride's sister was married at Shillingstone last year so it was wonderful to welcome the family back. 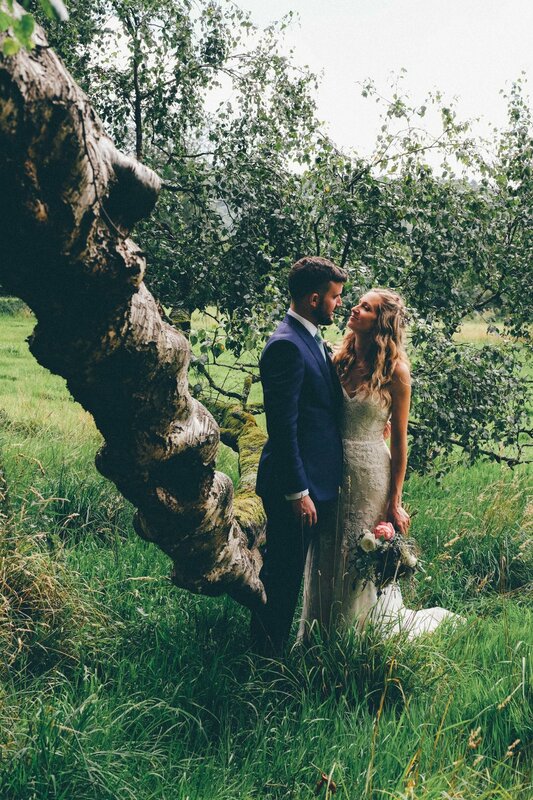 A very different style of wedding but just as beautiful. Western Marquees provided the marquee. The vast windows of their new clear span tent filled the space with light. 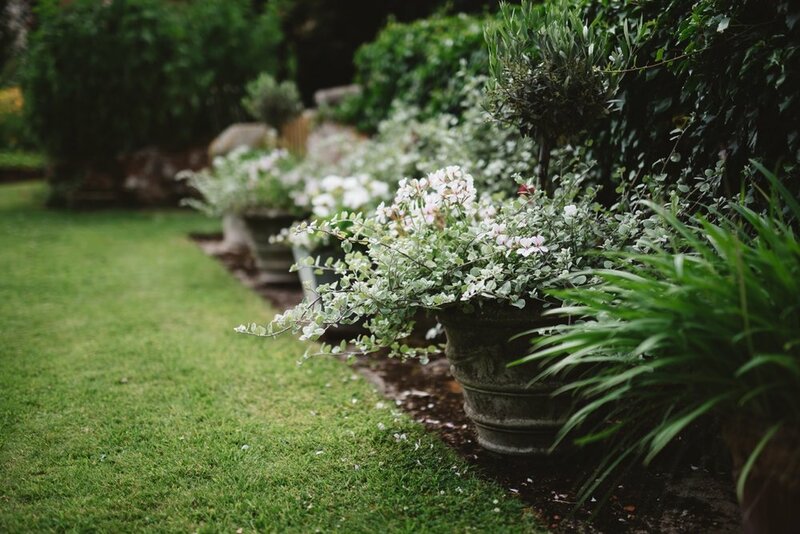 Containers of flowers and plants arranged by the family welcomed guests at the entrance. The bride had take huge trouble to get everything perfect on the tables and laid them herself. Inside the marquee the bride and groom had thought of all their guests with toys for the younger ones. Later the lawn filled with bubbles! Photographs and mementos had been put out with a tray for guests to put their wishes of good luck. 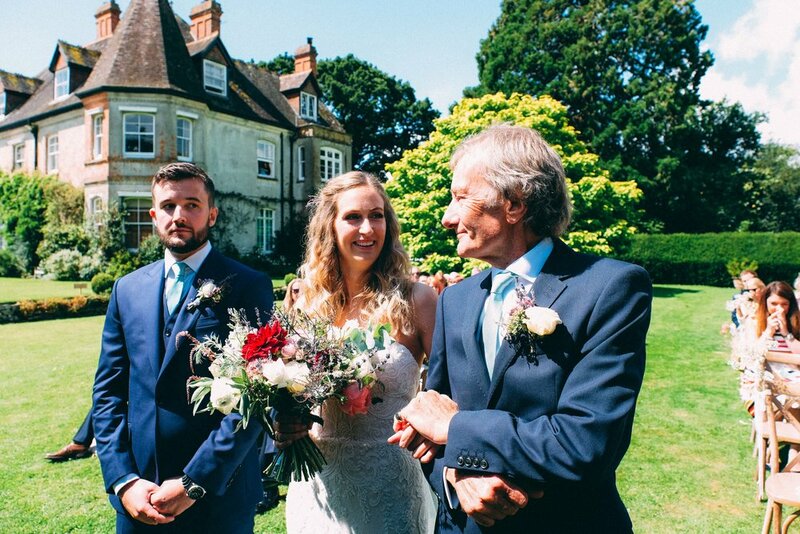 The bride came across the lawns on her father's arm to join her bridegroom at the gazebo. The sun continued to shine and croquet was set up on the lawn, with both adult and child-sized mallets provided and there was much happy laughter as the children played with this or footballs in the fields. 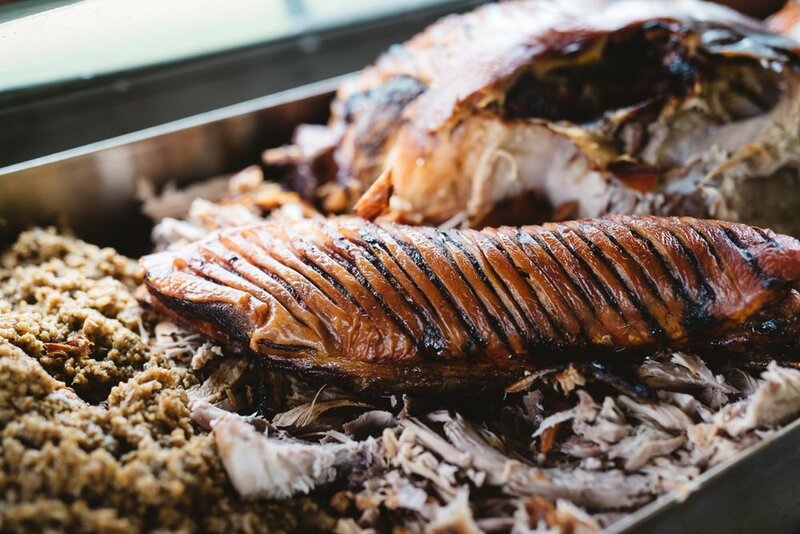 Sunday brought glorious weather and the party started again, when, with most of the wedding cleared, they relaxed on the lawn with croissants, and bacon butties cooked up on the barbeque by the bridegroom and his friends, not leaving until tea time. The bride and groom had put a huge amount of planning and effort into getting everything ready for their wedding. Sadly, they were badly let down by the Party Gazebos that they had bought. Family and friends to the rescue! A larger gazebo was lent and the wedding was on again. An army of friends and relations descended and beautiful hand-made paper pompoms were hung, black material lined the ceiling, fairy lights, disco balls and spotlights were strung and pink tulle was twisted round the poles and all in time for the ceremony. The bridegroom's mother had made a very smart post box for the good wishes cards. The groom and his team set out the tables and the chairs and put the final touches to the tent and then nervously awaited the bride. When she arrived, she was dressed in blue! She looked amazing. She walked across the lawn on her father's arm to the gazebo in the garden proceeded by her two bridesmaids and tiny page. The wedding breakfast was entirely catered for by the mothers of the Bride and Groom and the Bride's grandmother. The bride's mother had made the wedding cake, a towering pile of cupcakes. During the speeches the bride's brother, who has an amazing voice, sang "Oh, what a wonderful World" to the couple. Speeches finished and the tables were moved to the side to make room for the dancing. The DJ was another family friend and he kept the party dancing until Midnight. 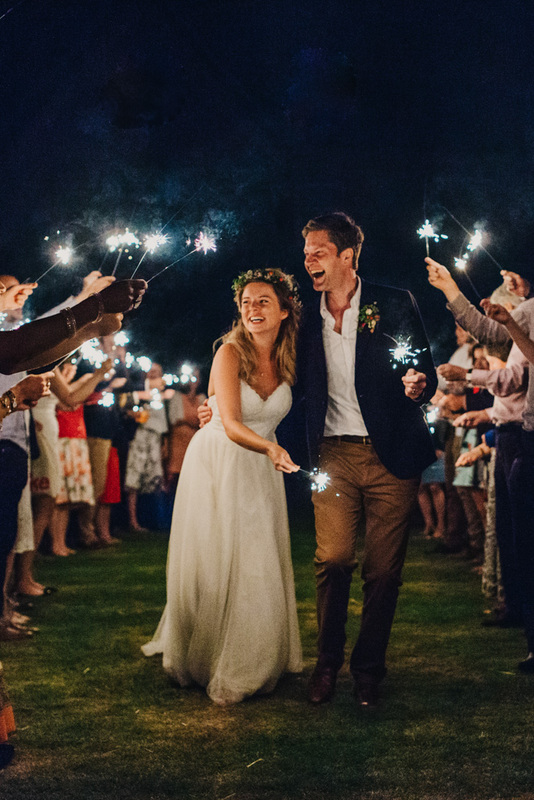 As the lights went off, guests kept the party going by lighting sparklers. The bride and groom spent the night in our Bell Tent in the Walled Garden - the first couple to use the new "Indian" interior. The end to a wonderful family celebration. 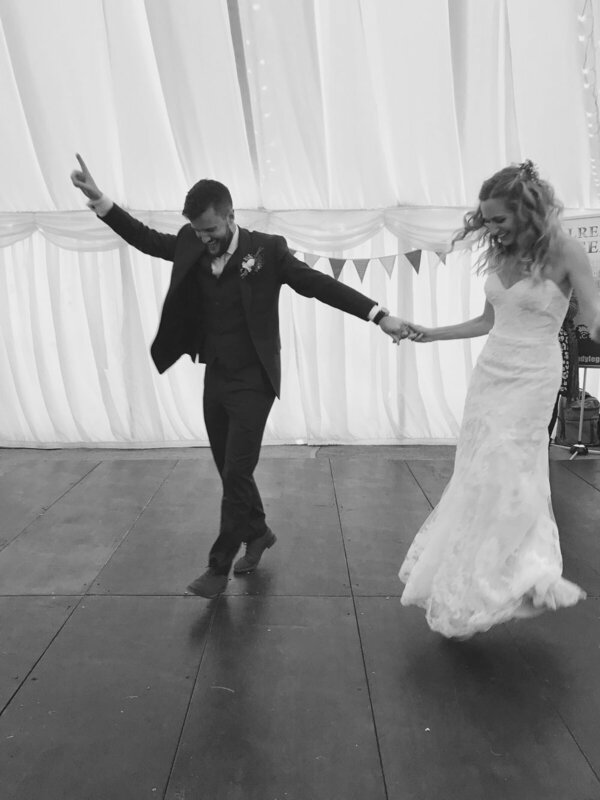 The majority of the photographs were taken by Sophie Williams, a family friend, who is hoping to set up as a Wedding photographer. Thursday saw the arrival of a new marquee supplier Marqco Marquees - (www.marqco.co.uk) The bride and groom had chosen the Capri style and each arch was decorated with garlands of roses and ivy provided by Marquo who also assembled the most beautiful rustic tables and outside bar with pallets from India. The bride's mother had spent many hours making the most beautiful ties for the backs of the chairs and runners for the tables. The dark hessian went perfectly with the dark brown chairs and the dark wood of the tables. She also made ties for the serving tables outside in the garden..
Parents from both sides, friends and relations arrived bearing car loads of props to decorate the marquee and grounds. Even the groom's father's bicycle was enlisted. The bride arrived just before midday to see the registrars in the dining room before the ceremony. She looked stunning with flowers in her hair and a wonderful floating dress. 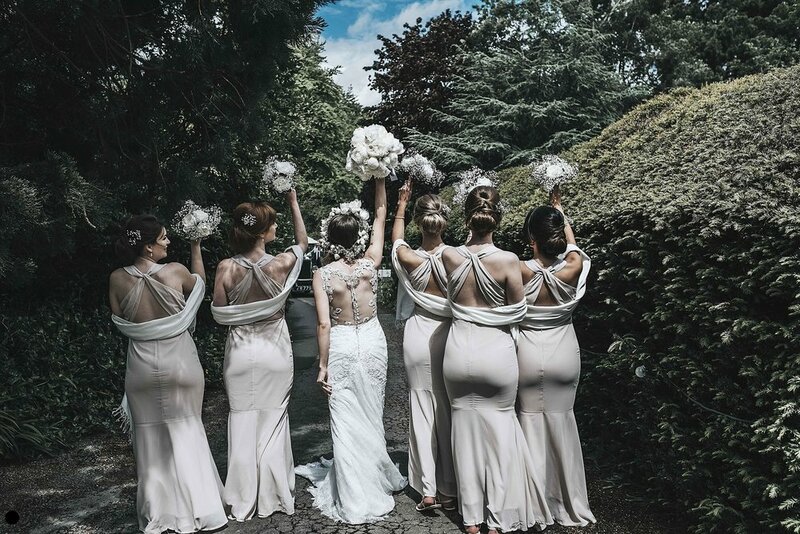 Her six bridesmaids were all in cream but in dresses that they had chosen themselves. The overall look was very Grecian. The bride and her father crossed the lawn to the gazebo for the ceremony, preceded by her bridesmaids. 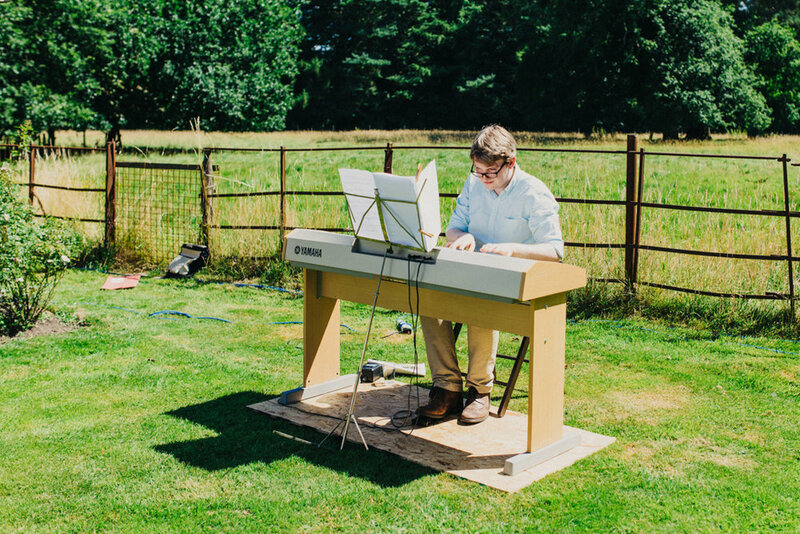 A family friend played the piano during the ceremony and the bride's sister and the best man did readings. After the ceremony the guests mingled on the lawn and were treated to a display from the Wessex Morris Men as the groom's father is one of the team. One guest said as they stood on the lawn watching the Morris Men - "When I die and go to heaven, I hope that it will be just like this!" By now the sun was really hot and guests gathered in the shade to have their picnic lunches served from hampers. The hampers and picnic rugs, like the champagne glasses came from Forget-me-not Vintage. Lunch finished, guests emerged from the shade of the trees to try riding the "wobbly" bicycle, make huge bubbles or just wander in the grounds with a cooling drink from the bar. (if you look closely at the picture by the bar you will see an enormous bubble floating by!) The children tried their hand at cricket or foot ball in the fields, undeterred by the heat. Formal, but wonderfully informal, group pictures taken, the bride and groom were whisked off by Kasia into the gardens for photographs, with more taken in the evening when it was cooler and there were less shadows. 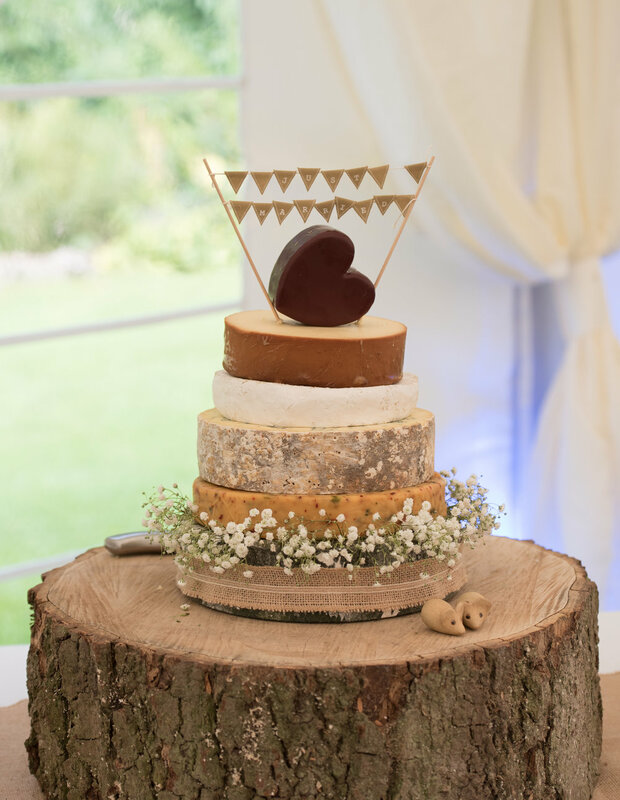 An incredible array of cakes appeared for tea, crowned by a towering wedding cake made by Cashew Catering. Tea was drunk from vintage china collected over the last year by the bride's mother. A friend had brought their drone to the wedding and this took some wonderful pictures from high in the sky. As darkness fell and the band continued to play outside, they danced on the lawn as it was still so beautifully warm! A first for Shillingstone, and recorded for ever in the evocative images shot by Kasia. Midnight brought the end to the music but not to the celebrations. The bride and groom were led to the Fire Bowl in the field by a Sparkler Procession ending in a triumphal arch of light. Guests drifted away to their tents or their beds leaving a few really close friends to chat into the early hours. 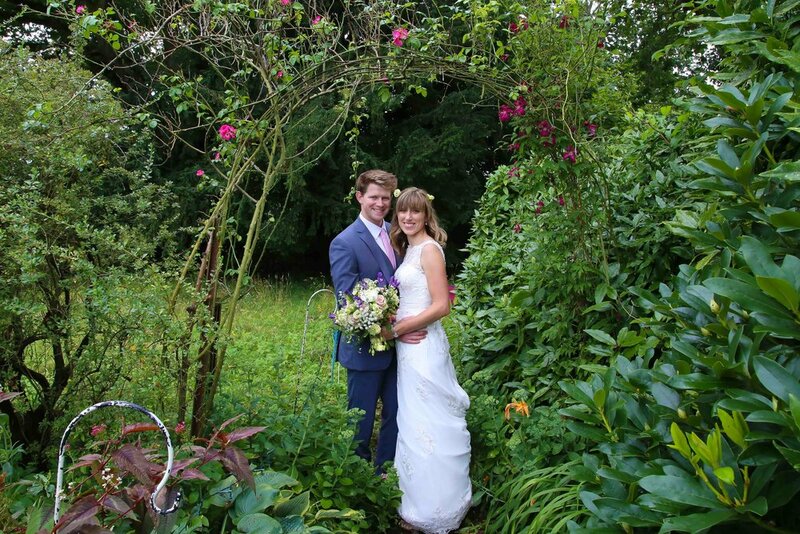 The bride and groom spent the night in our bell tent in the walled garden. Sunday brought the great tidy up as everything was packed away into cars and trailers with the groom's father's bicycle leaving last on the roof! The end of a magical weekend. The weather forecast during the week leading up to the wedding was appalling but the bride and groom were amazingly laid back about it and planned for the worst! Friday saw a team of helpers descend on the marquee. This was provided by Western Marquees - www.westernmarquees.co.uk/- who had provided our first marquee and suggested that we start a wedding venue! With the weather in mind they kindly provided extra carpet between the tent and the drive. The marquee was lined in ivory and hand made bunting loaned from a friend was looped across the ceiling. A beautiful daisy light hung like a huge dandelion head in the centre. 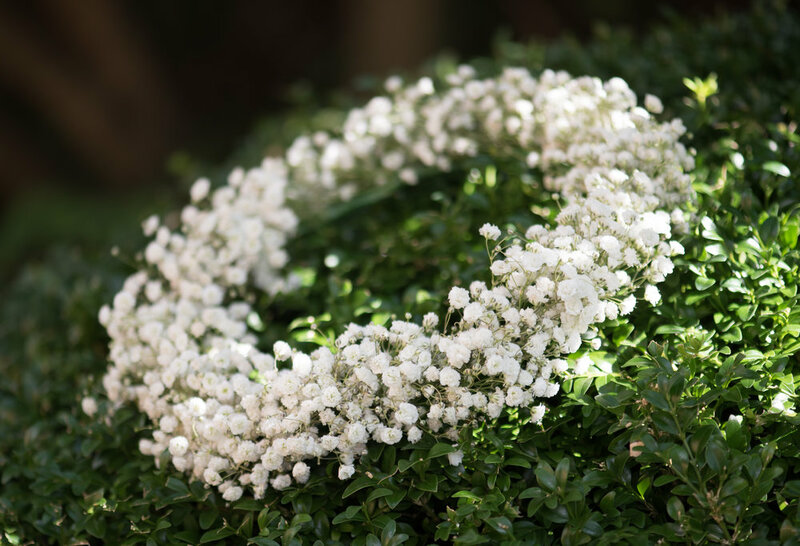 The bridegroom's mother had grown the most beautiful hanging baskets which were arranged on special stands in the marquee and looked stunning. 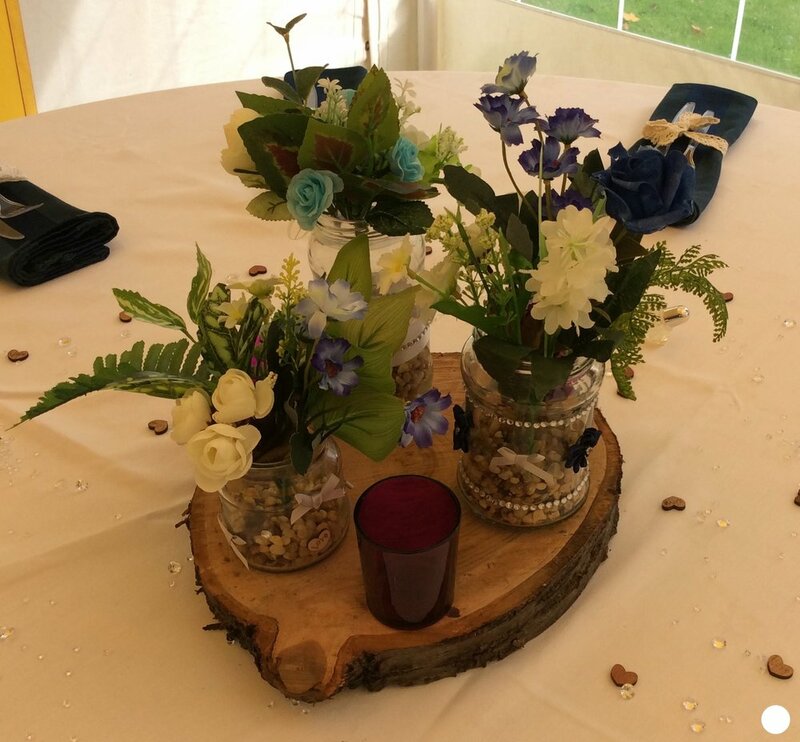 Trestle tables were placed in a U shape and the tables decorated with a hessian runner and jars of garden flowers arranged by the bride's Aunt. The bride had created many wonderful finishing touches over the previous year with the aid of the addictive "Pinterest". She said that unpacking them from storage was like an early Christmas! She had written all their notices in perfect script. A table was dedicated to those who could not be at the wedding including photographs of grandparents who are no longer with them. 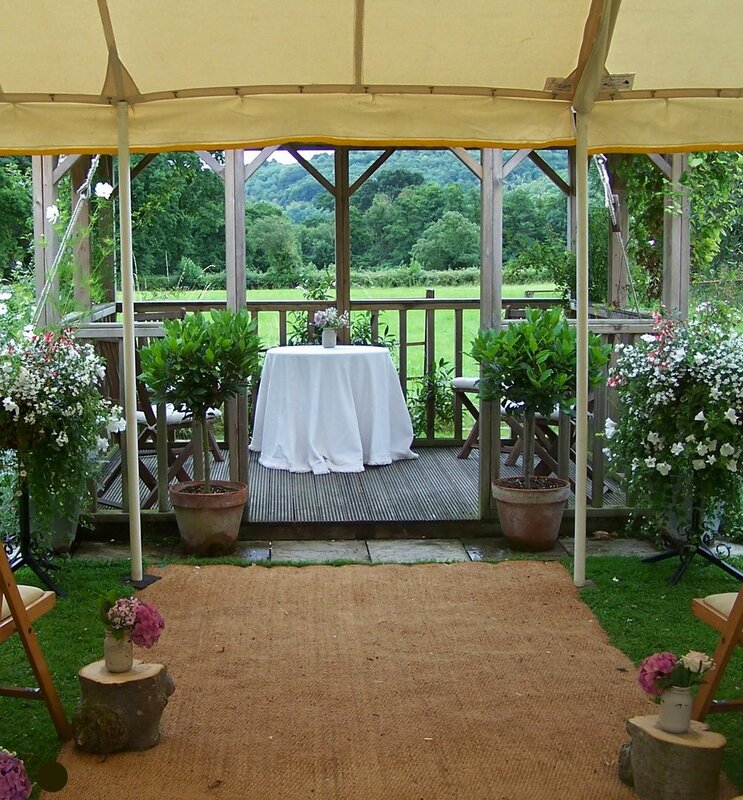 They had thought of everything- an allergy to wasps by one of the guests was solved by garden cloches over each cake! The bride arrived in a car that had once belonged to her father and which had been the pride and joy of a close family friend who had owned it since new. 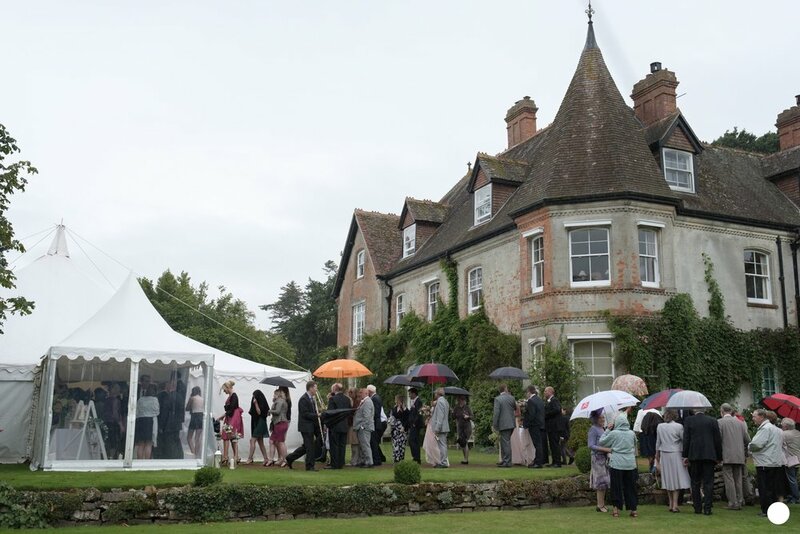 Guests moved from the ceremony to the marquee for tea where the most wonderful array of cakes had been provided by Sturminster Marshall Evening WI where the bride's aunt is president. A Gazebo was set up beside the marquee by The Perfect Pig, Hog Roast and Barbecue Co., run by a husband and wife team. Arrangements were made, in case the rain did not stop in time, for the evening guests to come and fetch their food but in the end the skies cleared. http://www.theperfectpig.co.uk. 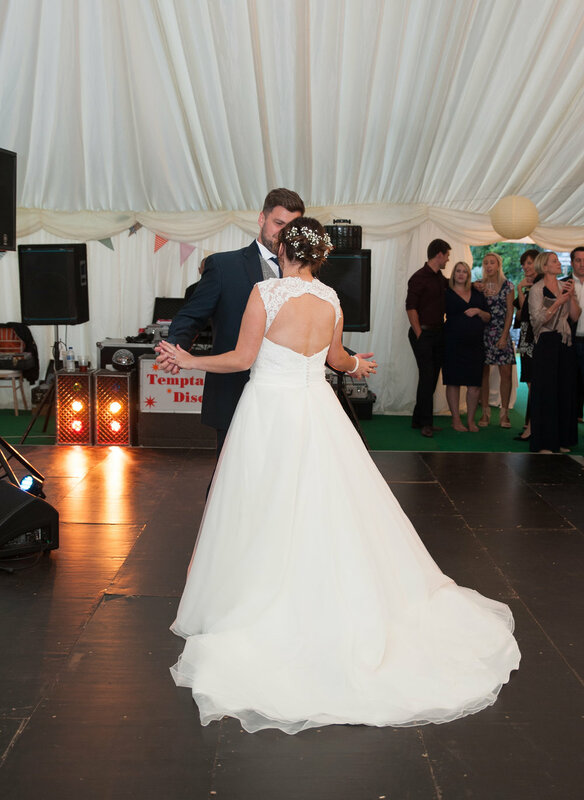 The party continued until midnight, dancing to the sound of Sam EB, DJ from Middleman Solutions, (http://middlemansolutions.co.uk) when many of the guests retired to their tents in the grounds including the bride and groom who slept in our bridal Bell Tent in the walled garden. Brunch was provided the next morning before the great tidy up took place! 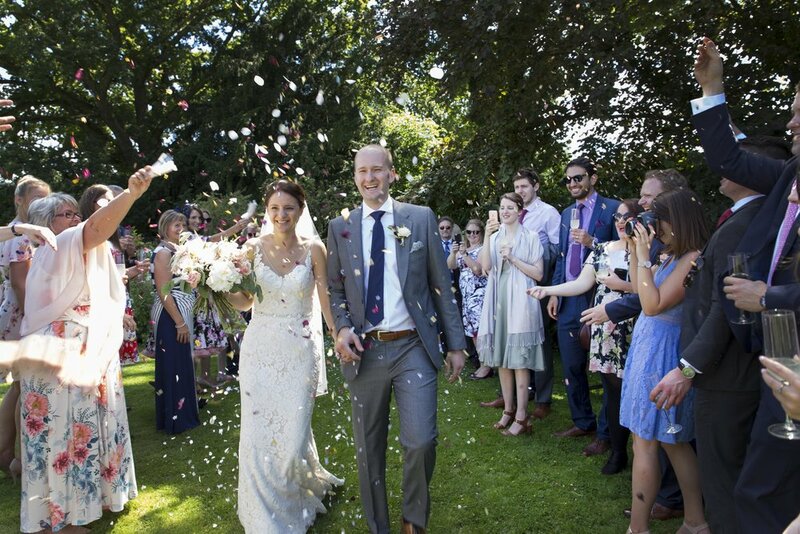 The Bride and Groom married abroad a few weeks earlier and came to Shilingstone to share this event with a Humanist blessing in front of their family and friends. The ceremony took place overlooking the fields with everyone gathered round them. The bride looked wonderful with her hair swept up and kept in place with a stunning clip. 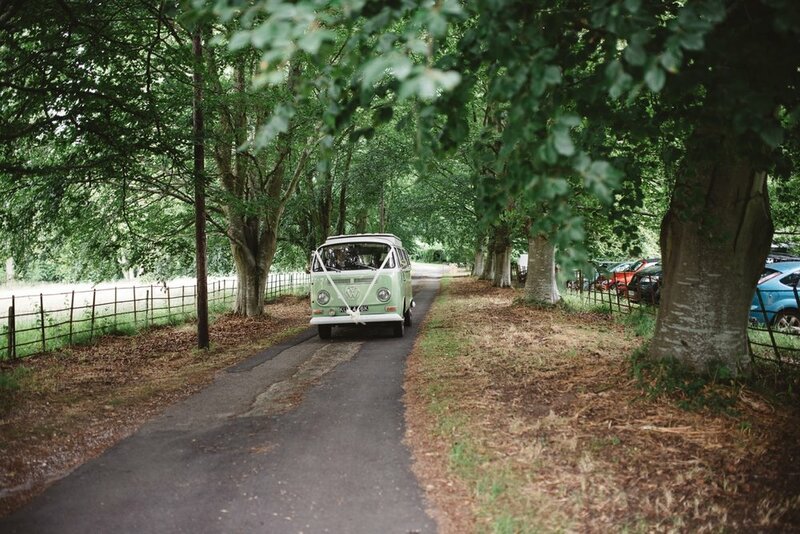 She arrived in a VW camper van called Betty. The celebrations were masterminded by her cousin, Claire Miles, who used to be a wedding co-ordinator. She arranged all the flowers and lent many of the props. Family and friends rallied round on the Friday to make sure that marquee looked perfect. Afterwards guests wandered in the gardens and children played in the fields, playground and lawns where games such as Giant Jenga were set up. The bride and groom were taken off for photographs by Sam from New Forest Studio - http://www.newforeststudio.com. (He took all the photographs not marked with a dot) He loved the old doors in the gardens when he wandered round before the wedding and managed to sneak them into the photographs! Salamanda Rock -http://www.salamanderrock.co.uk/ - provided the music and dancing went on until Midnight. 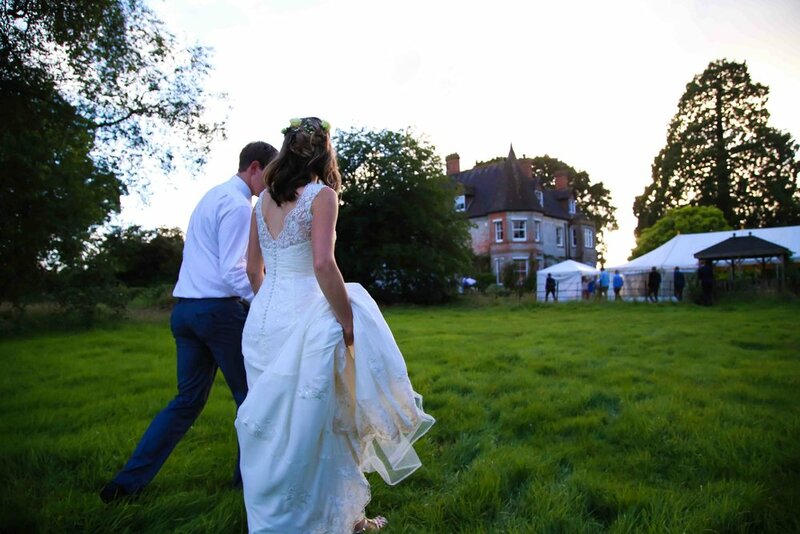 The bride and groom retired to the Walled garden to spend the night in our Bridal Bell Tent. Other guests camped in the playground. Brunch was provided for sleepy guests the next morning before helping to tidy up. Straw bales had been used for some of the seating in the garden and the temptation for the children to make them into a castle was too much! Straw everywhere - kindly raked up by the groom and friends. "Stunning location. Fantastic day. Couldn't have chosen a more beautiful venue. 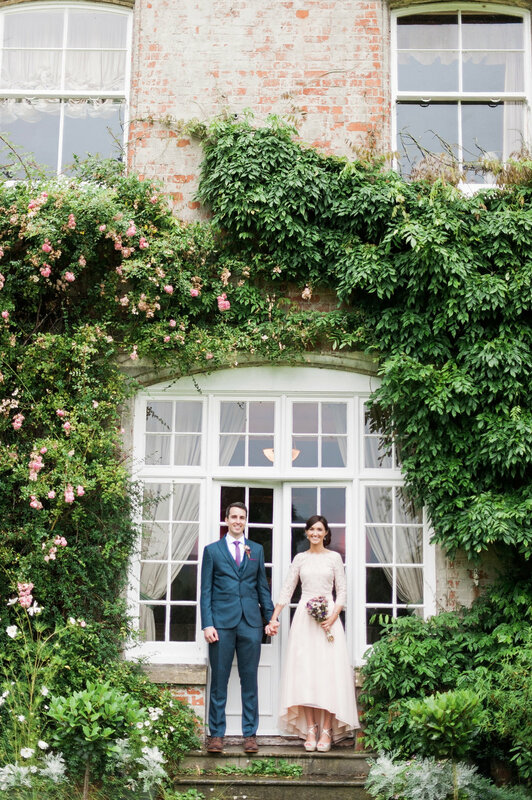 Thank you for allowing us to use your gorgeous gardens to make such a wonderful day." A huge marquee - www.dpmarquees.co.uk - went up in front of the house, covering most of the lawn. DP did an amazing job and Ollie and his team were there from 8am to 9.30pm. A white carpet gave a real feeling of spaciousness and the sofas, lighting etc .gave it a real "wow" factor! Friday saw the decorations arrive. First 10 trees for the marquee! 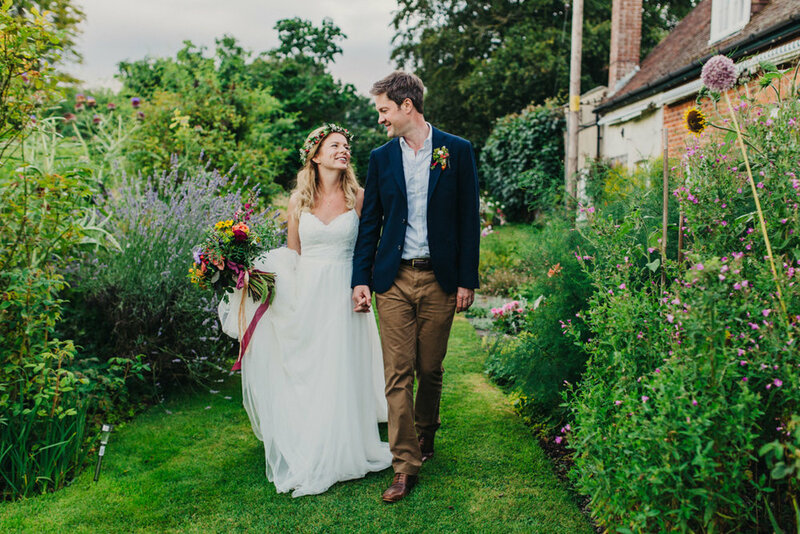 Hired from Castle Gardens in Sherborne - http://www.thegardeneronline.co.uk - and later festooned with little white lights, they were a wonderful touch. 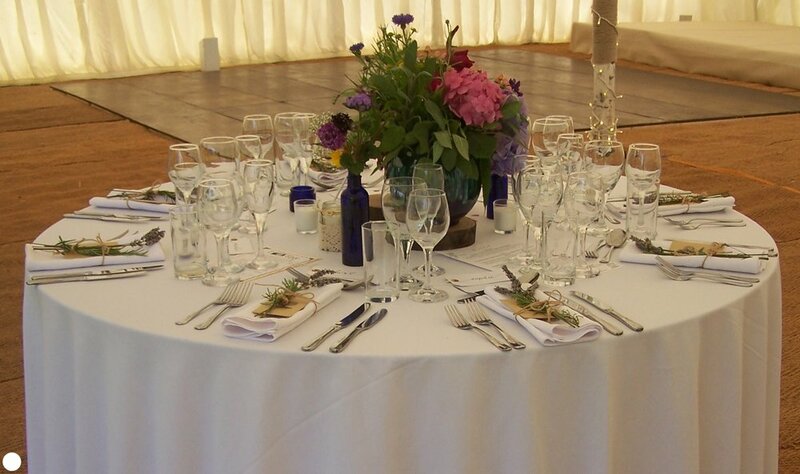 The Florist, Katy and her team from Rustic Rose, in Sturminster Newton - www.rusticrose.co.uk - first added the most amazing flowers to the candlesticks on each table and to the small tea glasses and vases (provided by Linen and Lace) dotted round the tent. The bride and groom added their own touches with round each glass with their guests' names engraved on them, plus mini Yankee "Wedding Candles" for the ladies and personalised playing cards for the men. The children all had individual bags of goodies. The bride had also thought of every comfort for the ladies with shawls to keep them warm and flip-flops for sore feet! The finished effect when all was in place was stunning! The bride was determined they were going to get married in the gazebo despite the threatened storms so, tent finished, Katy moved with her flowers to the lower lawn. First a huge heart made of eucalyptus was safely pinned in position, then she laid a rope of eucalyptus down each side of the "aisle", finally covering the front of the gazebo with the most amazing arrangement - so large that the registrar can be seen peaking out underneath during the ceremony! Saturday dawned and a final decision to go ahead with an outside ceremony was made about ten minutes before the bride arrived when the groom and guests moved out the benches from their storage place in the gazebo. The Bride and Groom met with the Registrars in the dining room of the house. The bride arrived in a vintage car that once belonged to her late father. 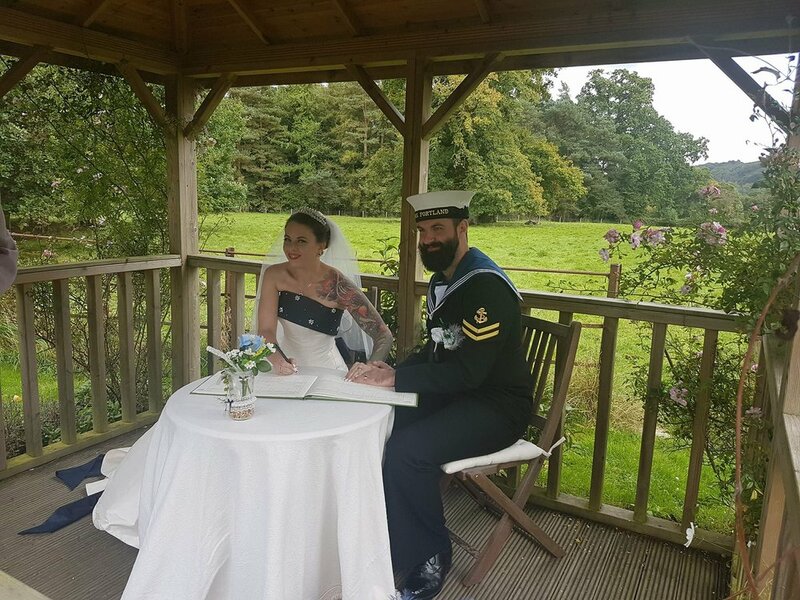 The bride, who looked terrified, was given away by her mother, but as soon as she joined the groom at the gazebo a huge smile came over her face! 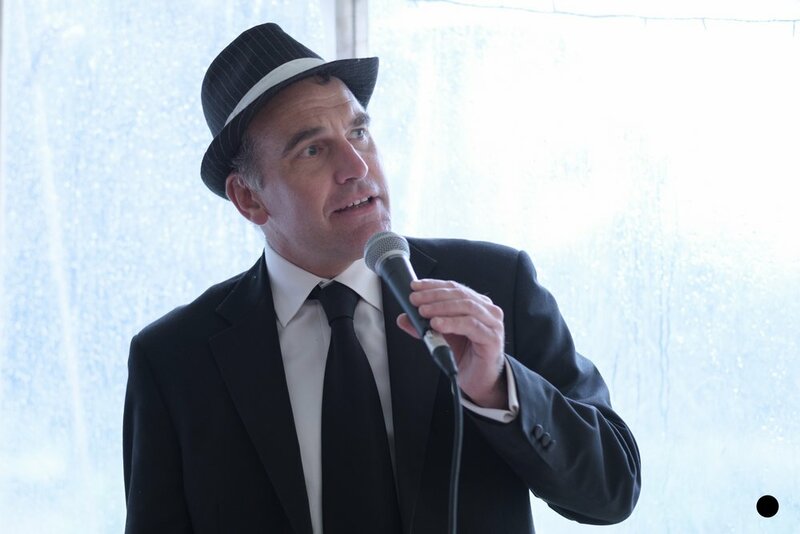 A beautiful ceremony followed with Dan Baker providing the accompanying music - http://www.danbakermusic.co.uk- As they finished the signing of the register, the heavens opened and everyone had to dash for the marquee. The wedding breakfast was served at 4.00. This was a fantastic two course meal cooked by Nick and his team from Dorset Fine Dining. Sharing pies were followed by meringue roulade to die for! We joined the party for the breakfast so I can verify this - chocolate and berries one end and lemon curd the other - http://www.dorsetfinedining.co.uk - They also provided the food later in the evening - fish finger sandwiches, pulled pork rolls, a falafel bar and chocolate roll for pudding! 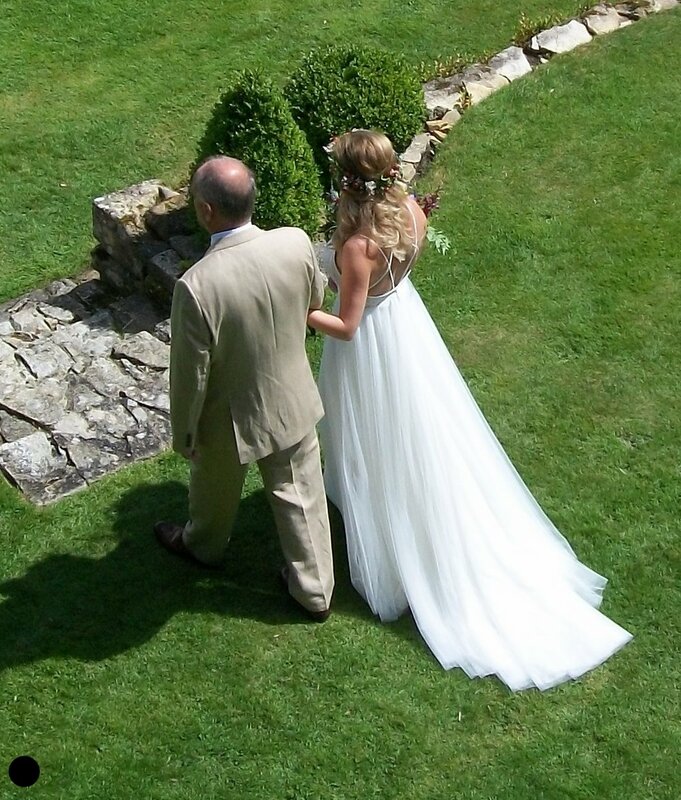 Quote from the bride " I can't recommend Nick highly enough! He really was amazing!" 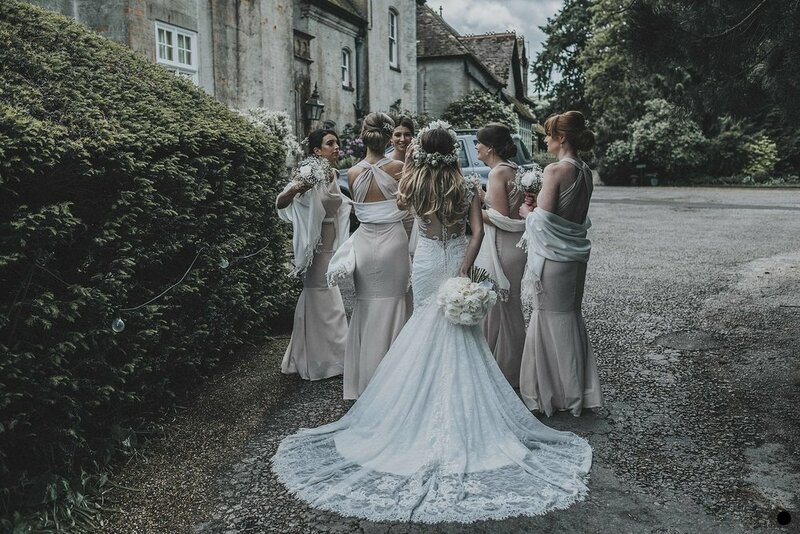 The wine and prosecco were from Yeovil Majestic who, the bride said, were very helpful and knowledgeable and gave them a free tasting and free delivery. The champagne for the toast was from Langham Wine Estate, near Dorchester, (www.langhamwine.co.uk). Innervision a live 5 piece band from Salisbury - http://www.innervisioninfo.co.uk -and a disco by Andy Martin from Alive Network (0845-094-3815) played alternately until the witching hour of midnight. 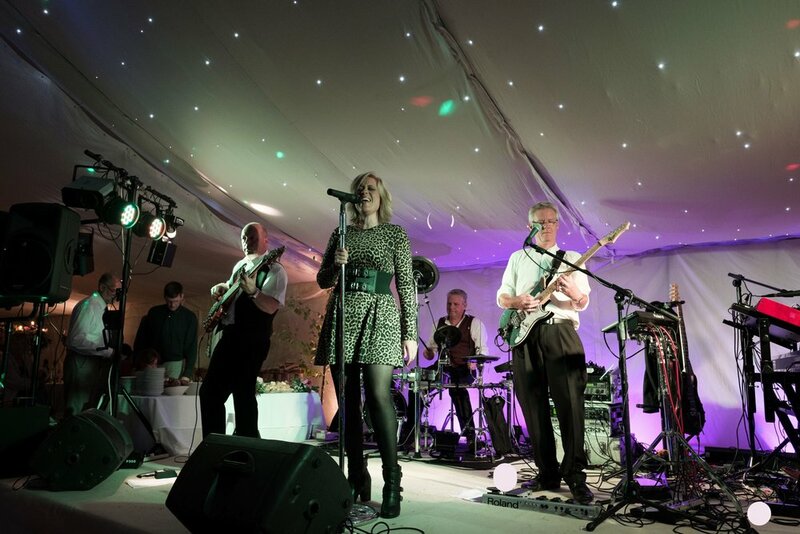 Both band and disco will cater for any genre of music and they certainly hit the right sound that night as the dance floor filled with guests of all ages. The disco lights gave the tent a magical look from outside. The cake was cut for the evening meal - a wonderful towering creation made by the bride's twin sister. 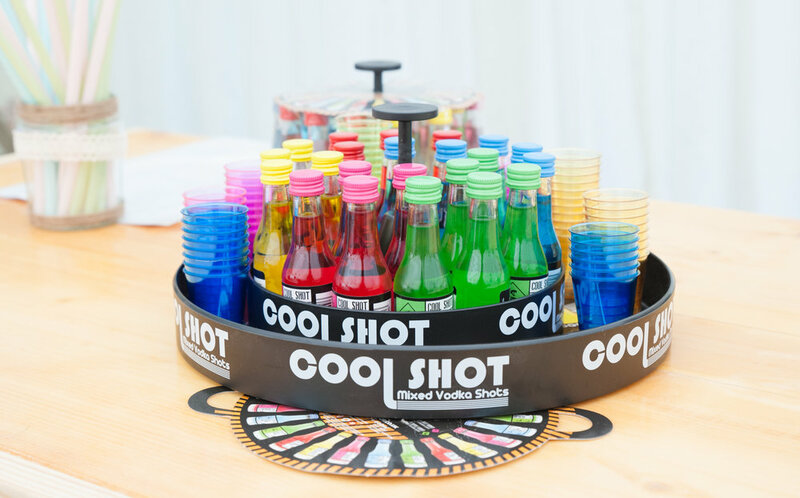 Every effort had been made to keep guests amused with a casino - Viva Las Vegas - http://www.vivalasvegasuk.com - set up at one end of the marquee where black jack and roulette were available. Proper chips could be exchanged for tokens given out to each guest to the "value" of £50. I lost mine very quickly but not without some spectacular wins and much enjoyment. I wish I could show you some of the pictures of the guests as they lost or won - some wonderful action photographs were taken by Belinda. 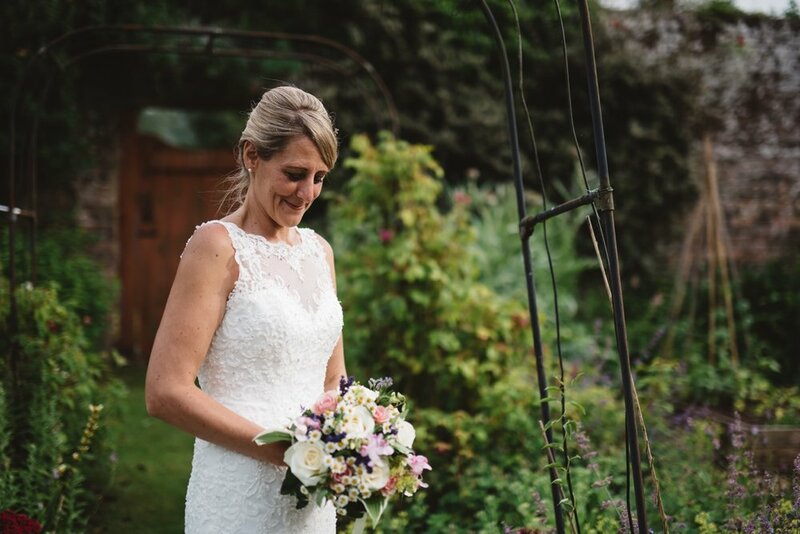 The bride had said that she wanted her wedding to be a wonderful party and without doubt it was that and more! 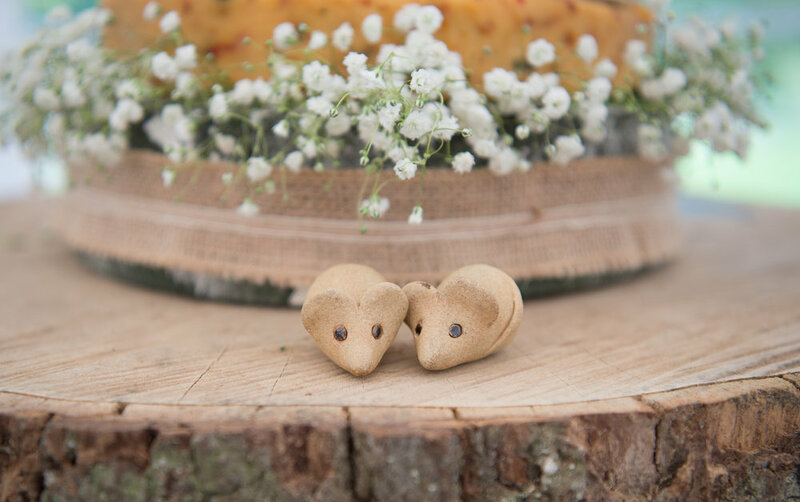 The perfect present for the bridegroom has come to our notice this week and we felt we had to let you know about them as soon as possible. You can, at present, have initials or a date engraved on the back and the company are working towards using personalised initials on the front. The wedding was remarkably relaxed and had a wonderfully happy feel to it. The gardens were looking at their best with all the roses in full bloom. The bride and groom met the Registrars in the dining room before the ceremony. Friends and relations gathered by the gazebo before taking their seats as the bride crossed the lawn towards them. 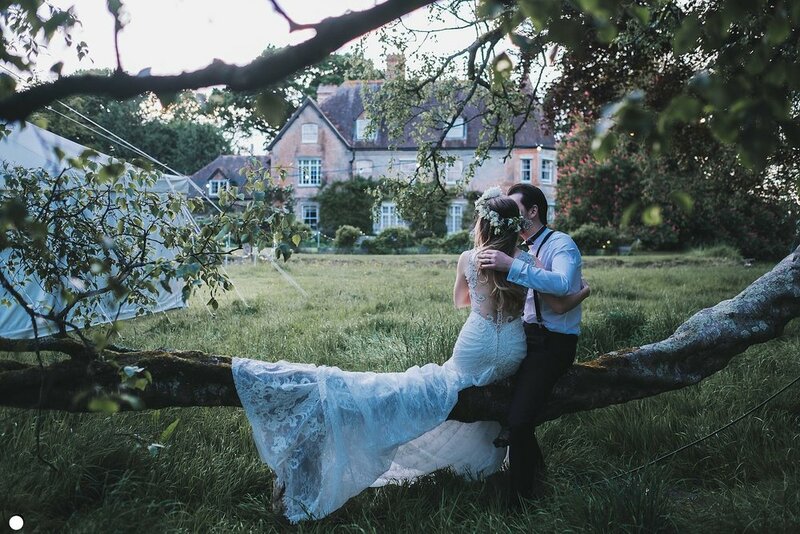 Wonderful photographs were taken in the grounds by Adrian Feltham - email - adrianfelthamphotography@gmail.com - who took all those not marked with a white dot. 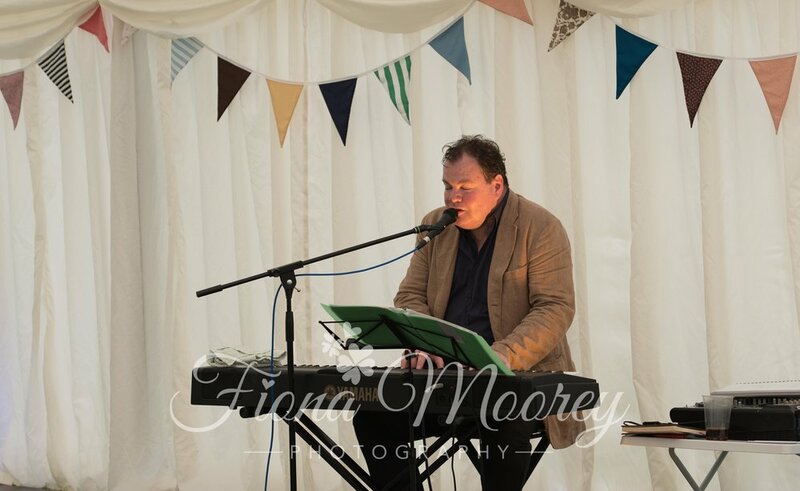 Photographs taken, guests retired to the tent for tea, produced by Littleton Caterers - Kathryn Fewings, Manor Farm Littleton, Somerton, Somerset TA11 6NP. Tel: 01458-272-741. Marks and Spencers had produced the most beautiful cake. The evening meal took the form of pizzas freshly baked in a Pizza oven set up on the drive by Pizza Dragon - http://www.pizzadragon.co.uk. Luckily they had an awning as the skies opened just as they began serving. It did not seem to dampen the appetites of those queuing and the pizzas were deemed delicious. Dancing continued until midnight when some of the guests retired to the bell tents put up for them by Honey Bells - www.honeybells.co.uk The bridal tent was complete with a tented bed! A barbeque breakfast was provided the next day before everyone helped to clear away. The end to a wonderful weekend. Thursday 14th July saw the arrival of the Poole and East Dorset Art Society. Twelve members set up their easels in the garden with some wonderful results. 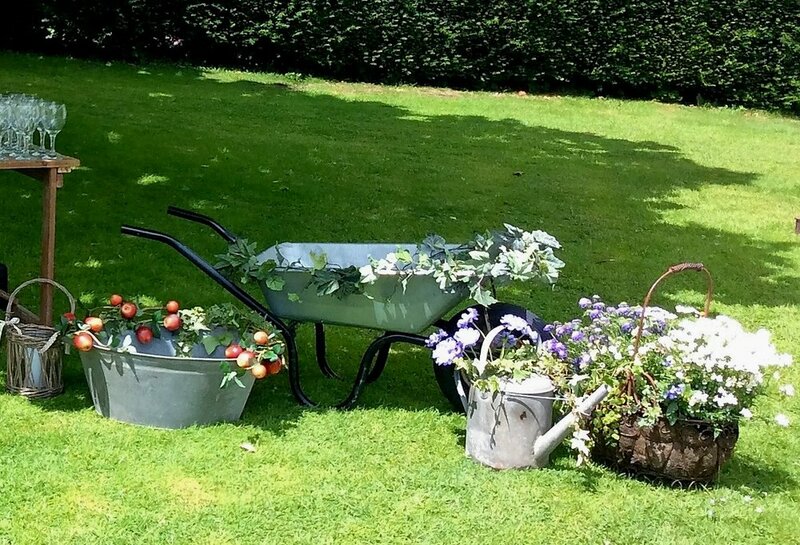 Huge choice of subject from the wheelbarrows by the potting shed to the vintage scales by the stables, from the walled garden to the Catalpa tree on the lawn. They very generously gave £4 each to charity and I sent £48 off to Home Start North Dorset, a charity I work closely with. 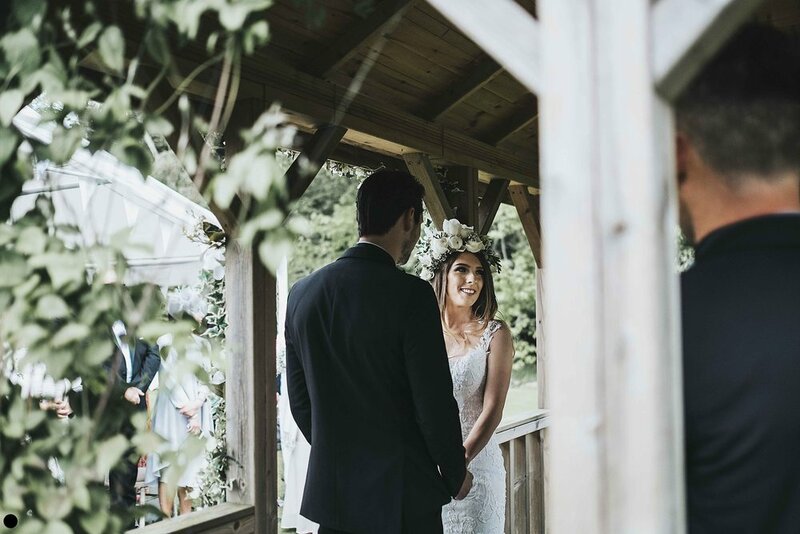 We were amazingly lucky with the weather - storms predicted - but the bride was determined that she would get married outside and her faith in the weather paid off! It was a wonderfully calm, family wedding. The bride works with children and she made sure that they had a fantastic time - from toys attached to their chairs in the Marquee to making full use of the grounds - playing football on the lawn, riding on the tractor etc. 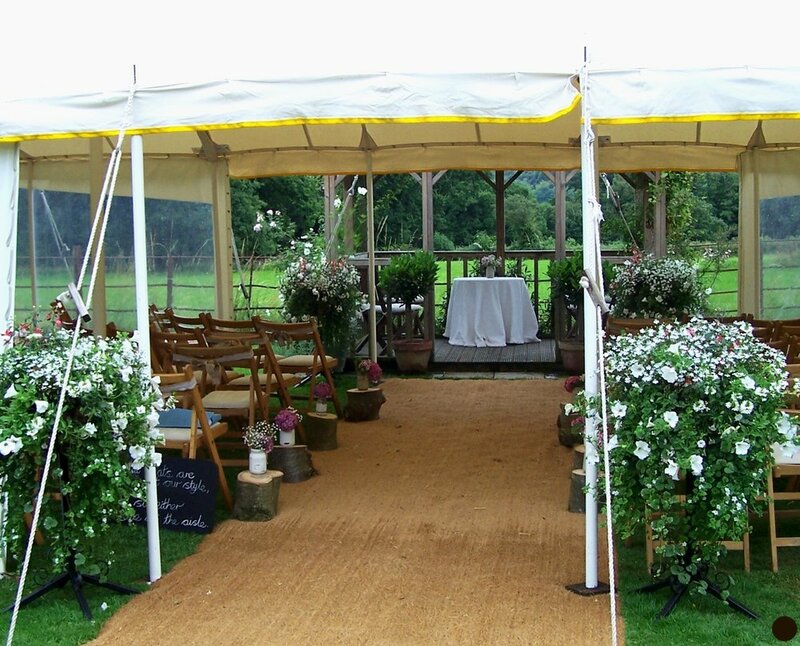 Affordable Marquees, ( http://www.affordable-marquees.com) who have been to Shillingstone many times in the past, provided a brand new tent with brand new linings and it looked wonderful. The family decorated the inside with ivy up the poles and lovely finishing touches such as a sweet stall. Flowers were arranged very simply but very effectively in jam jars and cellophane by Jane Edmonds from Penselwood - http://www.edmondsandhoward.co.uk/- where they grow their own flowers. The bride's mother had made and iced not one but two cakes. One stunning traditional one and one for the Bridegroom who is a Bournemouth supporter. The bride and bridegroom went to have their photographs taken by Emma a family friend. (She took the ones without a dot - the others were taken in house) She managed to sneak one of Michael and myself taking photographs of the Ceremony out of the window! Food finished and the serious dancing started! The band - http://www.facebook.com/thezigzagband - was fronted by the groom's uncle who is the lead singer. The dance floor was packed all evening. With midnight, the music ended but the campers continued to party round the Fire Pit in the field until they retired to their tents about 1.00pm. 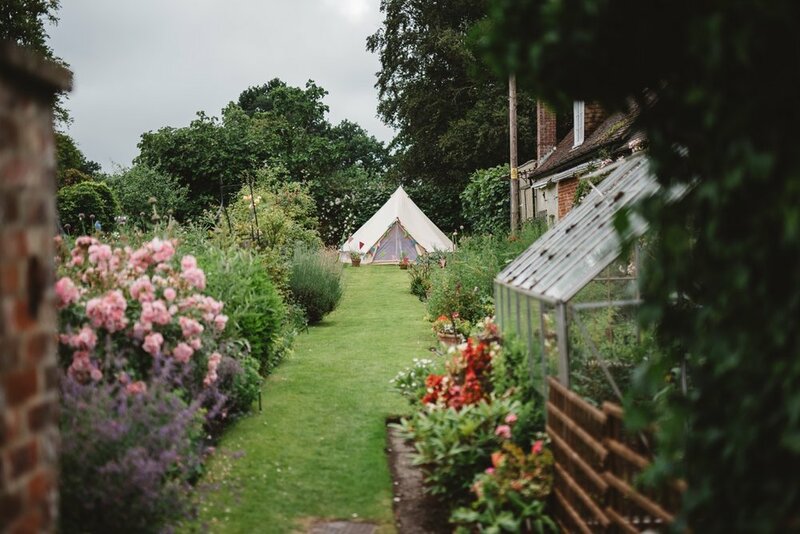 The bride and groom spent the night in the walled garden in our new bell tent which they luckily said was extremely comfortable! The following day the campers - there were at least 20 tents set up in the playground - gathered for bacon and egg butties. Later, after relaxing in the sun they had lunch cooked on a barbeque kindly loaned by the Gillingham Hockey Club which the bride plays for - seen below decorated by a huge bunch of balloons (a present to the bride's father). The children found these wonderful but some of them ended up in the trees as strings escaped from small hands! Still there 24 hours later, a lovely reminder of a perfect weekend. A wonderful family friend has really kindly given us 72 votive for couples to borrow if they fit their theme! 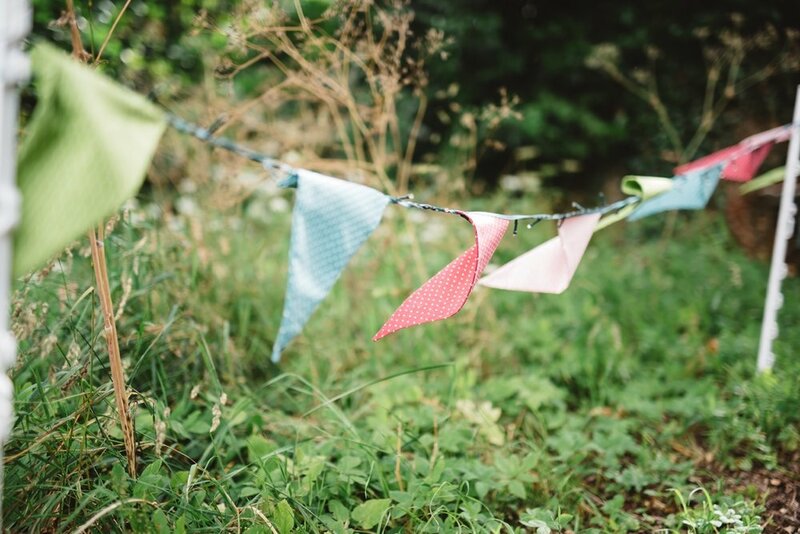 We have also got two rustic cake stands, yards of bunting, a fire bowl and photo booth frame. David Lewis has been helping us in the garden for over 9 years but has decided that he must now concentrate on his other profession - photography. He has been taking fantastic wedding photographs for many years but is beginning to enter the world of commercial photography. We are devastated as he has been a key part of making the gardens what they are today - enormously knowledgeable and incredibly flexible - pruning the wisteria on a high ladder one day and putting up the wedding tent the next/picking figs or planting carrots! We will miss him enormously but wish him well in his new career. 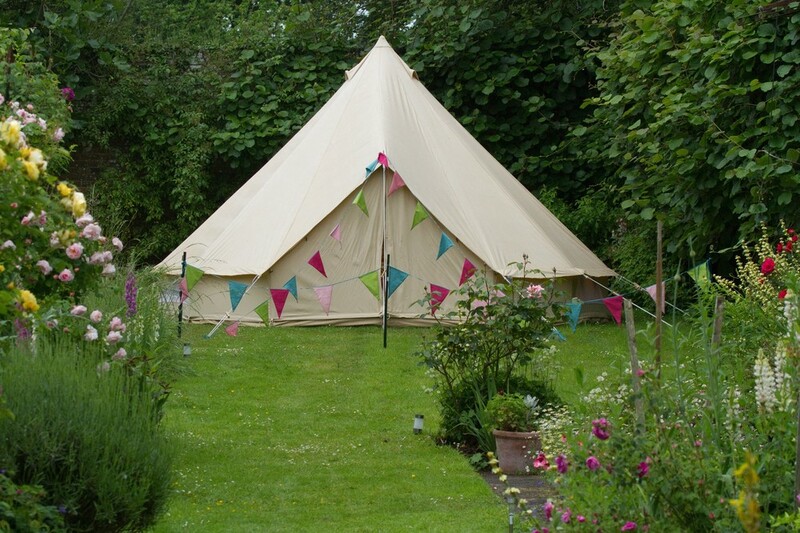 Our 5 metre Bell Tent is up and running! Fully furnished with a double bed, chairs, storage rugs etc., it has been tried and tested and found to be very comfortable. It is already much in demand for this summer's couples - at £50 a night it is a bargain! We had great trouble finding the rugs that we wanted until we saw Lidl advertising blue and white striped ones. We visited four shops on our way back from Cornwall to try and buy some - all sold out. Then the wonderful Manager of Lidl in Bridport, Paula, ran some to ground in Gillingham and reserved them - huge thank you to her! So far it has been set up in the Walled garden but you can place it in the playground if you prefer. Too long since I last blogged! We went to a wonderful lunch party a short while ago and found some brilliant new suppliers to add to our list. Prosecco was on tap from a mini van - Bubble Bros run by Ben Broad - http://www.bubblebros.co.uk - ice cold and delicious. Last but by no means least, the food! This was amazing - an incredible seafood spread followed by gluten free brownies to die for! Nomad Food - www.nomadfood.co.uk - just perfect for a summer lunch but they have a wide menu choice. A million thanks to our hosts for fantastic afternoon in the sun!